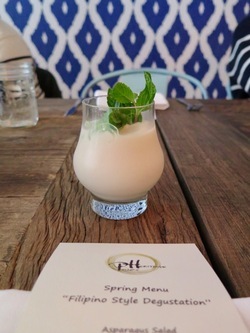 Starting the meal with a spiked coconut slushie with pandan jelly. All photos: © tablehopper.com. 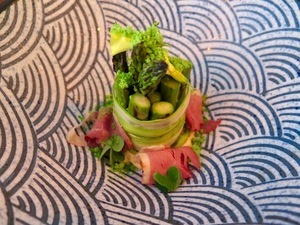 Asparagus salad with smoked duck. Lumpia sariwa with spring vegetables. 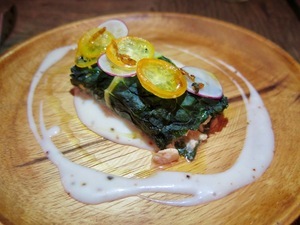 Alaskan halibut pinangat with Swiss chard. Pork adobo with mung beans and monay (bread roll). There’s a quality ongoing pop-up I wanted to be sure you have on your radar: ~PINOY HERITAGE~, from chef Francis Ang and his wife, Dian. You may recognize Francis as the former executive pastry chef from Fifth Floor, and who was then executive sous chef and pastry chef for Dirty Habit. He is currently consulting on the desserts for Taj Campton Place. You’ll find the Pinoy Heritage pop-up series on Feastly, which celebrates contemporary versions of dishes from Ang’s native Philippines (he and his wife travel all over the Philippines for inspiration). The tasting menu is an extraordinary deal: for $50, a recent menu spanned eight courses, and it was as delicious and unique as it was abundant. 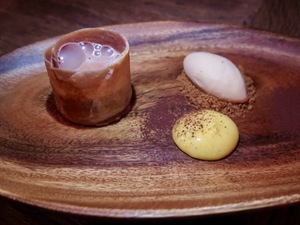 While Ang’s background is in pastry—these will be some of the better desserts you’ll find at a pop-up—his technique-driven savory dishes are just as well executed, full of balance and well-considered depth of flavor, and highlight seasonality in a creative way. Vegetables are front and center in his modern reinterpretations of Filipino classics, and for those of you who only think of Filipino food as fried and porky, well, you are in for a major readjustment. A recent meal started with an amuse of a molecular sphere of asparagus soup with pear and a little fried beltfish head on top (awesome bite), followed by spears of grilled Delta asparagus on a bed of salted duck egg gribiche, accompanied by rosy slices of smoked duck prosciutto and topped with an herb snow (sorrel, cilantro, parsley, mint). Gorgeous and a total plate-clearer. Lumpia sariwa is unlike any fried lumpia egg roll you know. 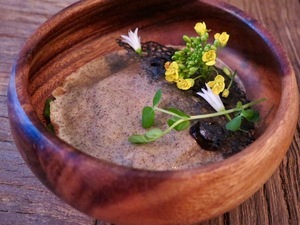 This vegetarian version paid homage to spring vegetables (like peas, cress, broccolini) under a thin buckwheat crepe, with earthy notes provided by a black garlic lacy crisp. So elegant. Vegetables continued to play a leading part with the Alaskan halibut pinangat: the rich halibut was poached in a coconut broth with coconut meat and ginger, served with baby shrimp and curry notes from vadouvan, all wrapped in a Swiss chard leaf, topped with thin slices of kumquats and radish—such a deeply satisfying dish that maintained some lightness with the chard. 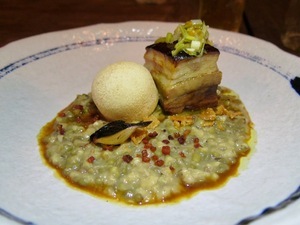 Even a heavier course of pork adobo (pork belly) came with bacon-braised mung beans—one of the lighter kinds of legumes—topped with little crumbled pieces of chicharon (you could mop it all up with their “monay” housemade bread roll). At this point, we were feeling very, very fed. Dessert started with a refreshing course of almond jelly with strawberry-rhubarb ice, followed by Ang’s modern and totally captivating spin on turon de banana, topped with a hot chocolate espuma (he even came back around and topped off people’s dessert plates with it, because more is more), along with passion fruit curd and miso caramel ice cream. The final bite was a mango pâte de fruit, an elegant touch you’d only see at higher-end restaurants. The team puts so much heart into this meal. Each course has a story, and you can see the thought and care that go into each presentation. The quality of the ingredients, the excellent preparation, advanced technique, and the uniqueness of the meal make this an extraordinary deal for $50. Check out the Pinoy Heritage page on Feastly for future dates. Another thing I really love about these kinds of pop-ups is it’s a good chance to check in with people you may not otherwise cross paths with—we all get to intersect at communal tables. At our dinner, I ended up meeting an amazing woman who manages a culinary training program for inmates at San Quentin, and an industry colleague brought his lovely mom who passed along some very heartfelt advice to me. These connections wouldn’t happen at a table for two at a restaurant, and during these especially challenging times in our current world, we need to encourage all the connection we can. Full belly, full heart—it’s the ticket to happiness.